My first official DesktopX widget. Hopefully it helps someone quit smoking. Well This is Fantastic Adam! Just given brainshot to me when i see code. I'm not completely happy with the graphics but, wanted to get the code out there. 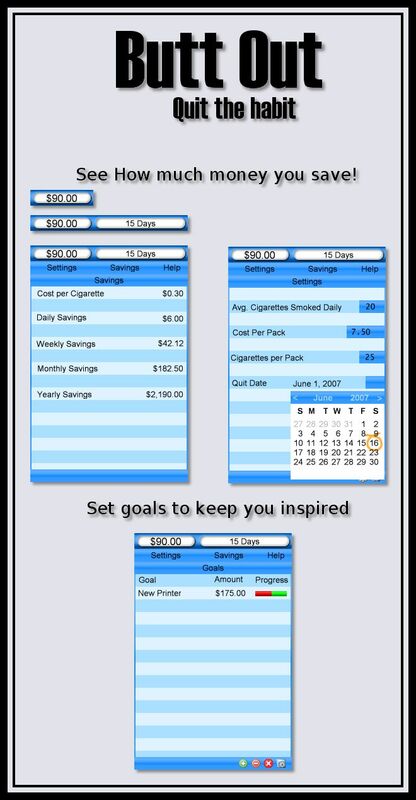 When I quit smoking 6+ years ago I had a similar type exe file that I download from AOL message board that was for people trying to quit smoking , it was called a ' Quit Meter ' and basically had same info but you used it to post your ' stats' everyday when you posted ( you hit alt/space bar ). So everyday you got to see how many cigarettes ' not smoked' and they even had ' life saved' according to the American Cancer Society ..